Chital, I think, are the most adaptable of our animals. Other deer, even other herbivores like blackbuck, chowsingha and gaur, are not able to change their habits to suit new and less congenial circumstances, but the fast-breeding chital is. For this reason, one needs to think twice, and twice again, before introducing this loveliest of all deer into new areas. The Andamans provide a graphic illustration of the dangers of such thoughtless introductions. 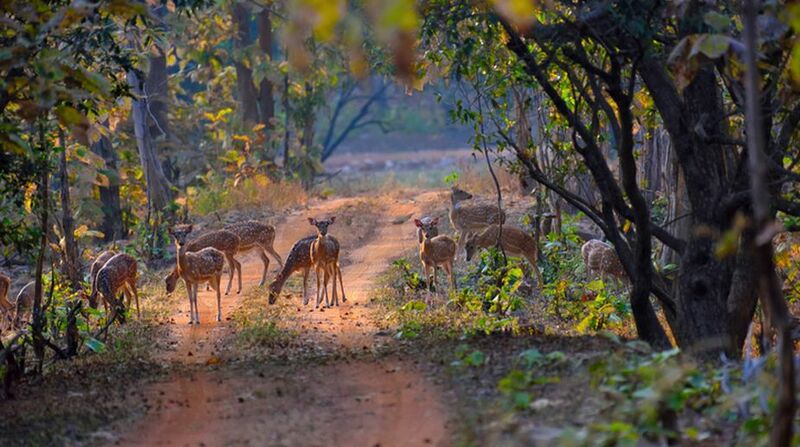 Years ago, it occurred to someone in these islands that the magnificent forests held no animals really worthy of them, and that nothing could add more to their charm than a few herds of spotted deer. Acting on the impulse, he had some chital brought over from the mainland. Colonel Williams’s nostalgic book about the early dais of the deer in the Andamans is evidence of how happy the move seemed at first. Then with no native predators to hold them in check, they rapidly overran the forests, and are now a menace to forestry, plantations and agriculture. Sadder but wiser by the experience, the Government of India shipped two leopardesses to the Andamans and had them released in the forests, to keep down the chital. Some months ago an official of the Andamans Forest Department called on me, and he told me that no one knew what happened to those leopardesses-they had disappeared mysteriously, and the deer continued to thrive and multiply. The aboriginal hunters, it was thought, would serve to keep the deer in check, but for many reasons this expectation was not realised; for one thing, the deer preferred forests which held few tribal settlements, and for another, the aborigines preferred pork to venison, and were content to hunt the small Andamans pig.<In fact, chital should be sternly discouraged in all places where their natural enemies (i.e., all excepting man) are not to be found. The chief of them are leopards, wild dogs, and to a lesser extent tigers; jackals and other lesser predators also serve to keep the balance of nature, but only in a small way. The Masinagudi area, on the borders of Mysore and Madras States at the foot of the Nilgiris, provides as excellent field for the study of chital. This is ravinecut flat country, with dense thorn jungles varied by open scrub and many watercourses, artificial and natural, and has long been celebrated for its chital, wild elephants and peafowl. The setting up of the Moyar project here has resulted in water supply being assured throughout the year, and the great increase in the humanity of the area has not inhibited the chital and the pig in the way it has affected other animals ~ the plantations and agriculture around human settlements offer them variety of food. Chital in and around Masingudi are exceptionally big and have splendid antlers; they are highly gregarious, and parties of over a hundred stags, some in hard horn, some in velvet, and some looking like hinds with polled heads and the antlers just shed are to be seen here at times. In the better wooded forests on the shoulders of the hill, only some half-a-dozen miles from Masinagudi, the deer are much less gregarious and are markedly smaller. Apparently chital do much better in well-watered open jungles than in dense three forests. Guindy Park in Madras, part of the Raj Bhavan compound in flat, blackbuck country into which chital were introduced comparatively recently, provides a good example of the adaptability of these deer. They are quite small in size here and have poor antlers, sometimes malformed, but they do as well as the blackbuck or better in this flat scrub country. They eat whatever offers and if the fare is poor are still able to survive, with a notable reduction in size. Like many other herbivores, they often eat fruits and flowers which are poisonous to humanity, such as the fruits of Randia dumetorum and Strychnos nux-vomica and the flowers of Thevetia neriifolia, and they can get along with they cover and shade provided by the scrub, though they are diurnal in their habits and like to lie down in the shade when the sun is hot. The one thing they must have is water. I have not seen them in the water, but am reliably informed that they are good swimmers.